At the town council meeting of Tuesday, 6th August, I was the only person to speak in the public forum section at the beginning. Basically, I said "Something something libraries, something something petition. Does the town council support the campaign against LCC's proposals for cutting the library service?" To which, Councillor Andrew Leonard pointed out that I should have been at the meeting at which this was all discussed, when Councillor Roger Featherstone made a presentation about the changes. I wasn't there, because it was one of those council meetings that went on late into the night and I skipped out early. But the important thing is that, yes, the town council do broadly support the campaign to keep Lincolnshire's libraries open. Mark Schofield gave the council a presentation about managing the wildflower habitat in the London Road cemetery. He works for the Lincolnshire Wildlife Trust, and he spoke about the importance of grassland meadows to the wider ecology. "Lincolnshire has suffered the loss of one species every two years since 1900," he said. 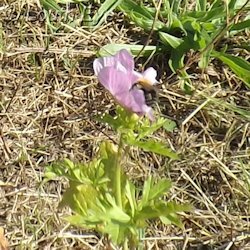 Wildflowers are important because they offer a continuity of nectar throughout the growing year. But not just any wildflowers will do. 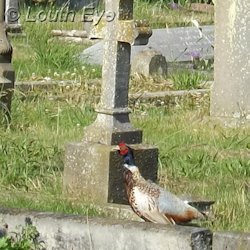 The LWT carried out a survey of the cemetery, and identified one area that's a source of "problem weed seeds", plants like dock and nettle that tend to run rampant and crowd out other species. So the LWT want to create a managed meadow area that would be sown with wildflower seeds, and cut only once a year. This could mean 40% of the 8.2 hectare site could be given over to wildflower meadows. They would recruit volunteers to help with this project, and it might mean a cost saving in terms of grounds maintenance. The town council employs two people to look after the cemetery. I don't know how large a part grass-cutting plays in that job, but it's presumably not all of it. It seems a little strange to go about recruiting volunteers when the town already employs people who could do the work of creating and maintaining wildflower meadows instead of quite so much grass cutting. On the whole I'm in favour of meadow creation, and it seems like a good thing. Mark Schofield runs a website called Life on the Verge, which is all about a volunteer project tracking wildflower corridors on verges throughout the Lincolnshire Wolds. Have you ever been to a nightclub where people have said of it, "this is a real meat market"? Well that could literally be the case, with what I like to think of as Keep Louth Special's "Mosh Pit" plan for the cattle market. In case you think I mean that in a pejorative sense, I don't. I think Nick Louth's presentation to the council about a rejuvenated, refurbished cattle market has all the hallmarks of awesomeness. Louth is really short of a decent-sized venue to rock out in, except perhaps the town hall, and I just don't see that being given over to the kind of energetic dancing that young people prefer. Since this year's Small World festival was billed as the last ever, there's definitely a gap in the market. So, Nick Louth outlined a plan that would include a dedicated motorcycle-friendly parking zone, and converting the cattle market on days it's not in use for livestock trading into an entertainment venue. Then there will be an external climbing wall, an external band-stand seating area where people can sit and admire the bikes and climbers, and new retail buildings focused on outdoor activities such as camping and sport. There's also the suggestion of developing the nearby site on the corner of Newmarket and Upgate as a hotel. Nick Louth described this as "a positive alternative," to anything East Lindsey might offer. "The livestock market stays. It would be renovated. ... The climbing wall would be a magnet for people." "The idea is to make every square foot of it earn its keep, seven days a week," he continued. "The roof would have solar panels on it." At the moment, every single vehicle that visits the cattle market must be pressure washed, for reasons of hygiene, and this costs a lot of money. Talking of money, the cattle market has already lost a chunk of its 2007 estimated valuation of �10 million, and in 2012 its market value could be down to �7-9 million. Mr Louth explained that this is due to supermarkets taking more interest in smaller sites, and expanding into the corner shop market rather than going for big stores that sell everything. Nevertheless, he did mention a figure of �1.2 million as an estimate for the site's income. Crucially, a lot hinges on the outcome of Aldi's proposals for the Malt Kiln site. If their plans go ahead as advertised, the building of a new budget supermarket would reduce the market value of the cattle market for supermarkets considerably. So if ELDC are dead set on selling off the cattle market, it's not in their financial interest to allow the Aldi proposals to go through, in spite of the support Aldi has had for its plans from the general public and the town council. In general, Keep Louth Special's proposals for the cattle market are ambitious and exciting, and they involve some pretty hefty numbers. KLS are talking about creating a destination, rather than merely re-arranging the current retail offering in Louth. I think these plans have a lot of merit, and they deserve closer consideration. 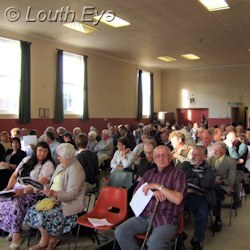 The council voted to agree in principle to Keep Louth Special's proposals.